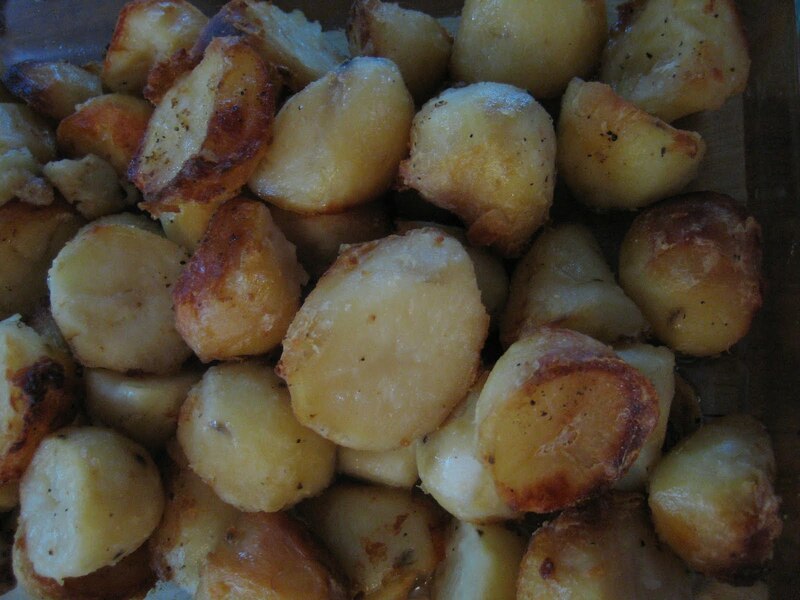 In my family roast potatoes are always included in a celebratory meal. Getting the perfect roast spud is definitely worth learning because they will make you a legend, even if only for a meal. I've read many ways of doing them, and method is ultimately a distillation of a few methods, plus some things I have learned. Peel and cut up the potatoes. These ones were quite long and skinny so I cut them in thirds. You want the chunks about the size of a golf ball. Then boil them until they are tender but not totally falling apart. Drain them, and then put the lid on a give them a couple of good shakes. This roughens the edges up to give more surface area. More surface area=more crunchiness later. While this is going on, put a good chunk of fat in your pan - about 125-150g. This will look like half a North American stick of butter. Put this in your preheated (350 F) oven to melt and then tumble your potatoes in. They should look like this after you give them a good grind of pepper and some salt. See the mashy bits on the outside? These will transform into golden shards of yum. And you can also see a chunk of un-melted lard. I just decided to throw some on top because there were more potatoes than I have anticipated. Then put them in the oven. If you're doing it with a roast, then just put it in at whatever temp you need for the meat. They are very forgiving. Use a spatula to turn them over every so often so that all the sides brown (the underside browns first) and pull them out when they are perfectly crisp and golden all over. Reckon on this taking about 2 hours at 350F. If I am doing them with a turkey, I put them in at the beginning and just pull them out when ready. I then bung them back in the oven to reheat them while the bird is resting. Make these. You'll be a legend. Love it. Going to steal this.